“Winter is coming” has become a well known saying, but for exotic plant lovers it is a yearly tradition to be well prepared before winter actually kicks in. For palm trees planted outside in the open you can find everything you need to know in this article “How to protect your palm tree during winter”. For palms in pots the method is slightly different of course. In this article we give you all the information you need to successfully protect your potted palm trees during the winter. Of course, it is important to be aware of the exact characteristics of your palm. 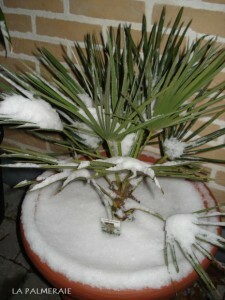 After all, it does not make sense to keep a tropical palm outdoors if you have freezing winters. Generally spoken, palms that are hardy to -3°C (26,6°F) are better place inside before the frost kicks in. For more tropical species, even a higher temperatures needs to be respected. By example, the Bismarckia must be kept above 10°C (50°F) at all times and is therefore better place in the warm living room way before the outside temperatures are to low. For hardy palms, is feasible to keep them outside during winter. The basic principles will remain the same you will just have to protect earlier than the palms planted outside in the open. The exact hardiness of one species is not always easy to determine. On the internet many different values can be found and sellers do sometimes not hesitate to exaggerate the hardiness for obvious raisons. We have already seen Trachycarpus fortunei been sold with a hardiness mention of -25°C (-13°F) while -18°C (0,4°F) is a lot more realistic. Some fora do propose “freeze data” with actual experiences of other hobbyist but keep in mind that not all conditions are always identical. Place your palm in pot just before the winter close to the façade. Thus it benefits from the radiant heat of the house and is sheltered. Put the pot on a pedestal to avoid contact with the cold ground. A few cubes of wood, a large tile, … Everything that is stable enough will do. Pack the pot completely with an insulating material. This does not even have to be breathable. Bubbles plastic is perfectly suitable. This prevents freezing of the roots. Cover the top as well so that you can manage the moisture of the soil yourself. If the weather forecast indicates more severe frost than your palm can handle, you can take the palm inside as long as this frost persists. A cool space is ideal, light is less important during this short period. A garage, garden house, … are all suitable. The warm living room is less ideal due to the large temperature difference. Do not forget to water your palm during the periods without frost!